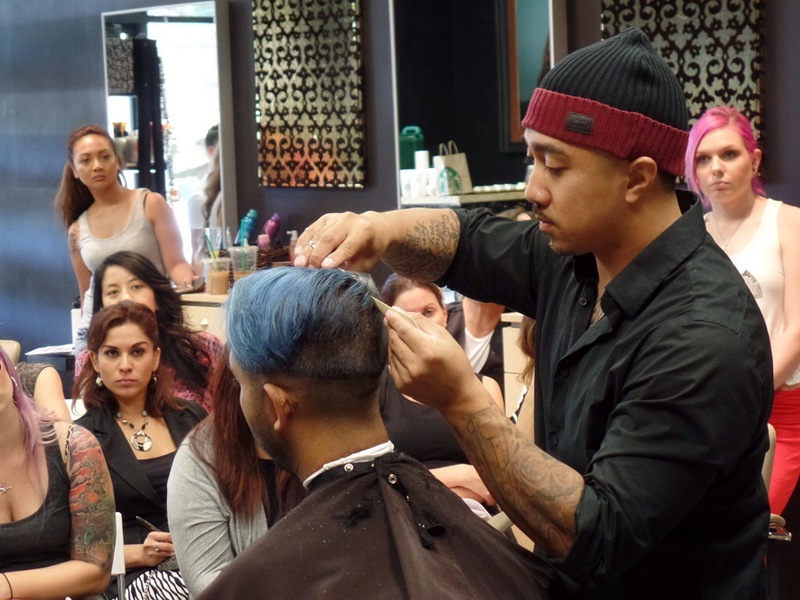 A couple of weeks ago, my buddy Chris aka Cream The Barber presented the opportunity to assist him in his Hattori Hanzo Clipper Cutting class. While at one point the opportunity to have my own haircutting class presented itself, I truly felt that (at that moment in time) I wasn’t fit to teach anyone “my” techniques. But, that was a while ago! And helping out for a class wasn’t something I couldn’t do. So, it was done! 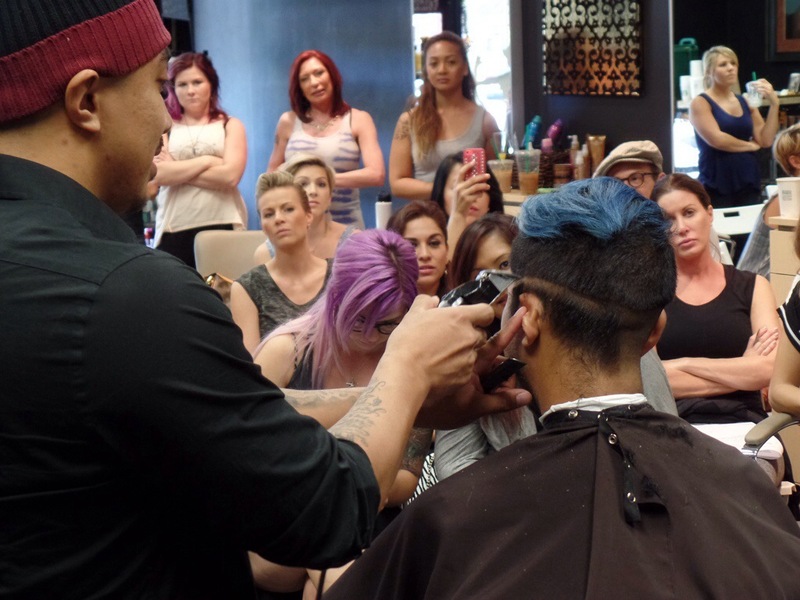 The class was held at a salon in San Jose called Stocks and Blondes, which oddly enough was a salon I was relatively familiar with. 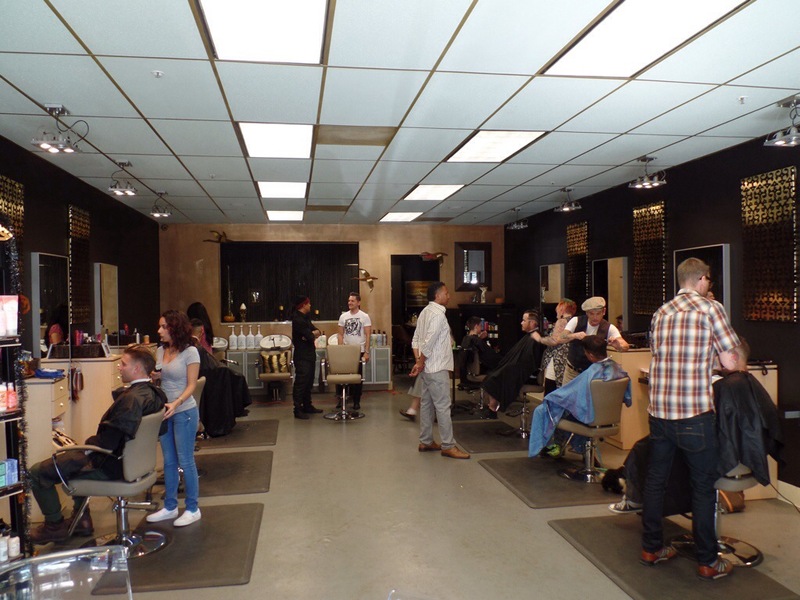 The salon was set up to accommodate 40 or so stylists/barbers. 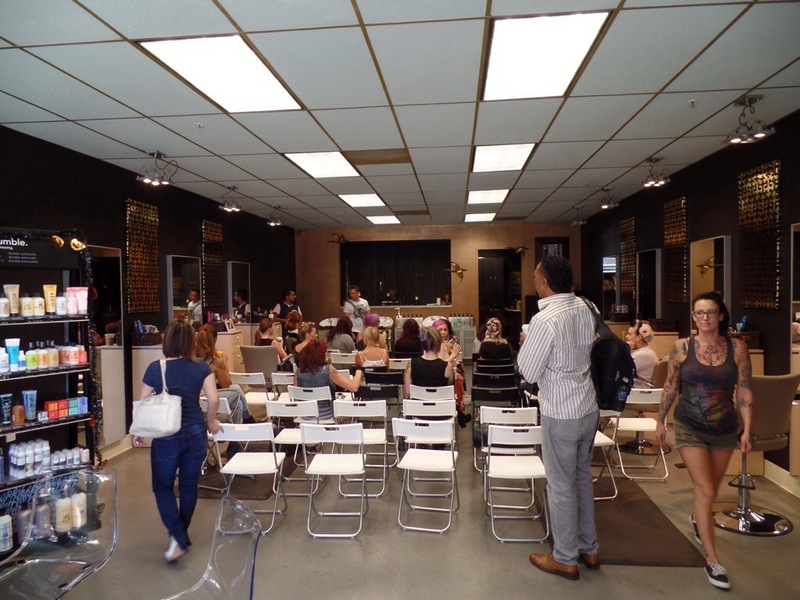 At first, I was skeptical that it would be that big of a class, but as we got to the salon, finding an empty seat wasn’t easy! Pretty sure there were a few people left standing. Since we were dealing with more stylists than barbers, getting them hip to clipper lingo was important. Funny enough, a majority of these gals probably have been doing hair far longer than I have, but weren’t well versed in barber terminology for the hardware we use. But… that’s expected… Since it’s not something they do on a daily basis, it’s not surprising that their knowledge of clippers wasn’t the same as a barbers, especially since a majority of them were used to scissor-over-comb everything! But, with a crowd this eager to learn, it wasn’t difficult getting them up to speed. After the theory portion of the class, it was time for the fun part… THE DEMO! Chris has his way of fading, which is similar to many barbers, but is also different from a lot of barbers… yeah, get it? Now: How does he fade? WELL…That’s something you’ll have to learn by attending one of his classes! Trust me, it’s well worth it. Why wouldn’t you invest in education for yourself? 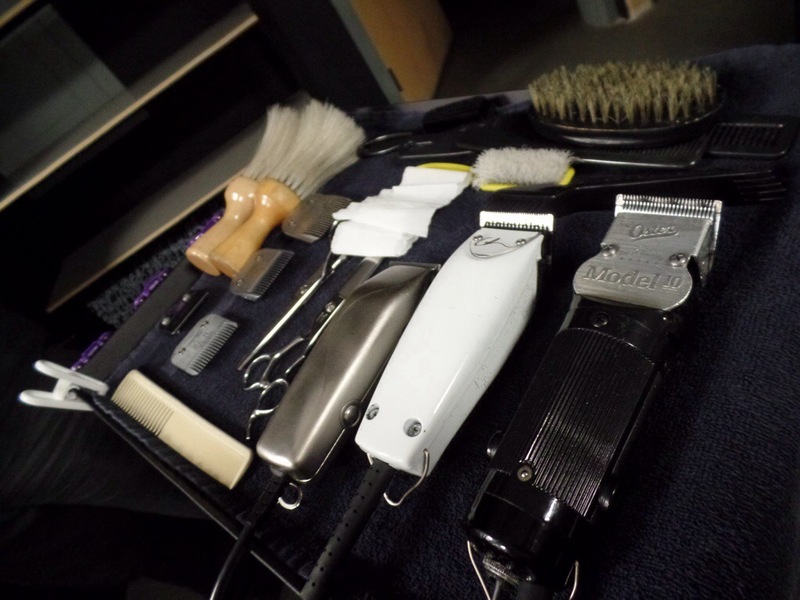 The tools and implements he would use to perform the haircut. What haircut would he demo? 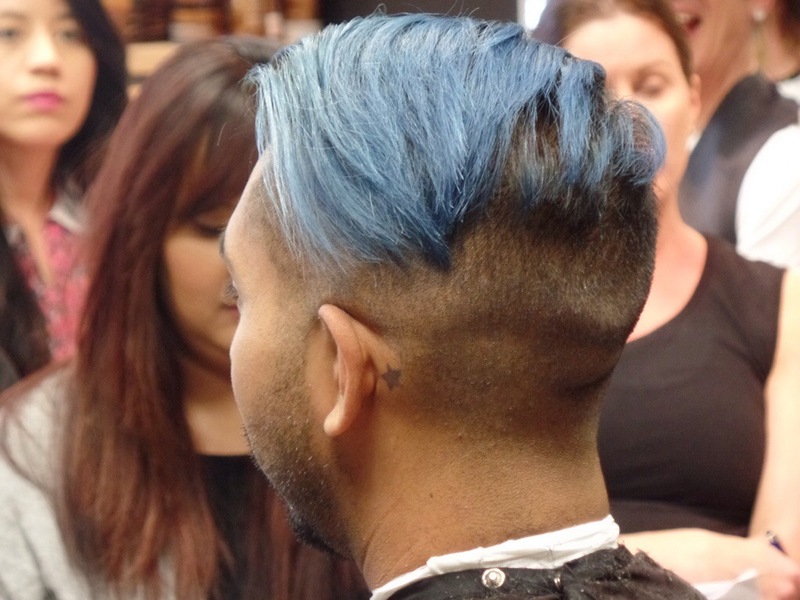 Of course, one popular one that you’ll see at least 3 of done in a shop: A zero fade with a sidepart/undercut/hardpart/combover/name that ‘do. Full attendance ready to learn! Demonstrating one of many ways to set a guideline. Throughout the demo, questions were asked, and where I could shoot my feedback, I would. I also asked a few questions that the class wouldn’t have asked, but felt it were something that would benefit them. I mean, hey, I’m here to help in any way I could! Can’t be a Hattori Hanzo class without using some Hattori Hanzos! After the demo was finished, the salon cleared out and there were 6 stylists left for the hands-on learning portion of the class. Now I could help out a bit more! For the most part, it went smoothly. Obviously, getting a hairstylist that is only comfortable doing scissor-over-comb to go as short as 000 was a mission! Hell, getting their clients to get comfortable with them going that short was a task in itself! But, with all learning experiences, it’s something you have to ease into. Definitely glad that a majority of them were up for the challenge. But the hard part? Was not having the right tools to perform the cuts! Now, a lot of stylists usually have an Oster 76 with only a handful of blades, or the familiar Wahl Designers. But not everyone in the class had the tools on hand, or the right blade, or guards. So, for some of them, a bit of improvising was done. Others had to borrow blades from others. And getting them to be comfortable with handling the clippers was something that took a bit of getting used to. But hey, we’re here to learn. The overall experience of teaching someone how to cut hair was a blast. It makes me kind of wish I were able to have my own classes! But, that’s something that’ll happen later down the line! Having people willing to drop everything they know and do what you tell them to do made the experience that much easier. You’re usually met with rhetorical or backhanded questions whenever you try .to “teach” an existing stylist how to cut hair a certain way. It’s a given… You have people who have been doing something one way for several years, it’s not like you’ll be able to change their views on haircutting in one go. But, once you let them know that 2+1=3 as is 1+1+1=3, they’ll get it and become a little more welcoming to learning a new trick or two. Big thanks again to Chris aka Cream The Barber for the opportunity! I can’t wait to be cutting in his shop, where it’ll be like having a barbering class all day long! Well folks, I hope some of you are excited to see me posting again. Trying to work in the time to blog, work full-time and be a father is a daunting task! But hey, it has to be done! So stay tuned for more barbering related posts, backlogged pomade reviews, and more!